I want to gripe about something which is utterly ruining my enjoyment of television programs. God knows, there's few enough shows worth watching, but those precious broadcasts worthy of my time are forever blighted by one of the diseases of 21st century broadcasting: On-screen logos. Displayed constantly (except of course during adverts) in the top left corner of the screen, once you're aware of them, your eye is constantly drawn to them, or at the very least distracted from the program content. If you try, you can almost ignore them, but once you become aware of them, on-screen logos can quickly irritate to almost psychotic levels, as you try harder and harder to ignore them, you become more aware that you should not have to ignore them, because they don't need to be there! Some channels are worse than others. BBC HD, at least, has the decency to make their logo very transparent - which is still not as good as dropping it altogether. Sky (and in particular Sky HD) is the worst culprit. Their logo is very prominent and rather spoils their flagship shows. BBC1, BBC2, ITV and Channel 4 don't feel the need to spoil their broadcasts in this way, so why do the other channels do it? But it gets worse: Sky One waits until about 1 minute before the end of a program, before spoiling it even more. The tense cliffhanger of last week's "LOST" was shattered by the words "NEXT: Ross Kemp In Afghanistan" appearing in a large blue strip next to an already distracting logo, right at the crucial moment. WHY must they do this? Do they think we're stupid, or incapable of looking at our TV guides? 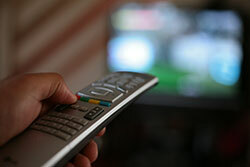 A single button press on our remote tells us not only what channel we're watching, but also what's on next. There really is no need to display this over the top of our favourite TV shows. I pay a lot of money for the channels I'm watching, I know what they're called thank you very much, I don't need a constant reminder in my face. I paid for a system where I can press a button to see the channel name, and also what's coming up next. Perhaps if enough of us write to channels like Sky and complain, they might actually listen. But I doubt it. I stopped watching the crime channel because of their tv guides on the right of the screen. They inform you that a proram is “New”. So what. They do not say that a program is old when repeats are shown by them. Some of the panoramas are totally spoilt because of this and I wonder which marketing drongo thought that this was an acceptable practice. Totally agree, I also don't pay for these annoying Logos and coming up next messages. Like you I have a remote and all I have to do is press a button if I nreed to knbow the channel i'm watching. Someone, please, please start a petition. Totally agree, am watching history in hd this logo is massive and intrusive!!! Please somebody start a petition now!!! Having unsubscribed from Sky, I have my bought Sky digibox which can receive many channels although unable to record. However, there is a large green Sky logo occupying much of the TV screen. Would appreciate any useful advice on removing the Sky logo, please. Thank you. I saw a film that I was interested in recording but alas it was on ITV with that stupid, pointless logo that is permanently on, apart from ads. I watch a few things on tv and I don't pay my license fee for pointless logos that spoil the film or programme, especially if it is to be recorded. Why can't these people let films/programmes finish properly! ANOTHER thing why can't those logos be turned OFF! Why they would need to be turned on is anyone's guess! BBC1 and BBC2 are the only channels that are not showing these stupid logos. Advertising perhaps?? Well when I change channels, I know to which channel I am going, like most people with any sense. I've made my point so I won't rant on about it. What is next? an audio message that comes up in the middle of a movie? Absolutely agree with everything said on this topic. And it's getting worse! This is probably my number one pet-hate and annnoyance as far as TV is concerned. But what can be done about it? Very little I suspect! Trying to boycott offending channels (the majority) seems an unlikely and unworkable solution since it would simply mean that we would not watch any tv at all. If only some of the bigger TV companies would realise how annoying the practice is and stop doing it then maybe others would follow but realisticaly I dont believe this is ever likely to happen. Ive stopped watching TV channels with on-screen logos I encourge other to sign up to Netflix they dont have them and you watch what you want when you want to and its far cheaper than Sky. some years ago sky tried to put logos on the movie channels that's when customers said i'm stopping my subsciption by the end of the month do you see any logos on the movie channels now, it was around circle. Finally I have found people who think like me!! I have been irritated by the channel logos for years and also feel they are totally unneeded. I wrote to Alibi after their annoying logo spoilt my enjoyment of castle but they just fobbed me off with some rediculous reason. Its true that they don't care about their customers, just profits. It seems to be getting worse. I'm waiting for the day the whole damn screen is an advert.....the day I throw my sky box out the window! Lets keep complaining maybe it will do some good one day! I couldn't agree more. I've been attempting to contact various channels, Velocity, History, Discovery, etc., to inform them that we know what channel we're watching and find their logo extremely distracting and ruining our viewing experience. We pay good money for our service and find it a disservice to put their logo on the screen constantly. We're considering canceling our service and go to over the air broadcasting and Netflix for our movies. I agree with all this. TV stations that put up Now and Next are so enfuriating. They ruin moments of tension/suspense or a scene were really into/ gripped by. TV bosses think we're all stupid- that we need to be told what's on. Why don't they listen to what their customers want. That would be providing a good service. Can we all write to the channel stations. There was a campaign a while back to lobby radio presenters not to talk over music that had some success I recall.